Will Shawn hit a vacuum pose at the 2019 Mr. Olympia? 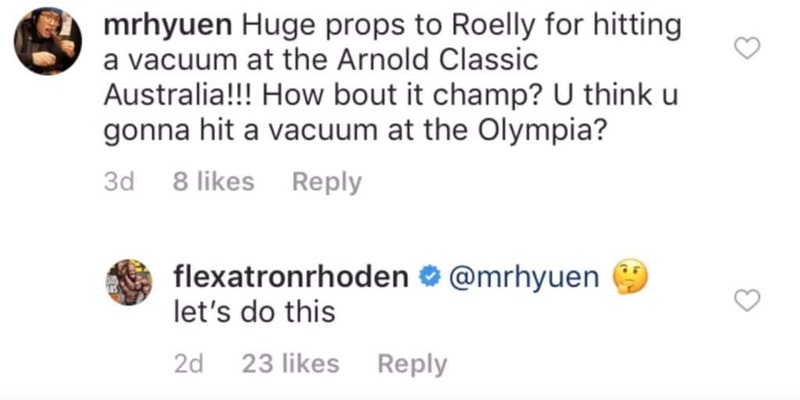 The 2018 Mr. Olympia champion Shawn Rhoden hints at the possibility of hitting a vacuum pose at the 2019 Mr. Olympia. But was he serious? It’s very likely! Now, Rhoden dethroned seven-time Mr. Olympia Phil Heath last year to win his first title and it would make sense that he’d want to please his fans and most importantly… not get scrutinized by Arnold Schwarzenegger. For those who don’t know, Arnold Schwarzenegger asked Classic Physique competitor George Peterson to hit a vacuum pose by after he won the Arnold Classic, and the legend wasn’t impressed. Many people even though he purposely tried to make a point that modern bodybuilders cannot compare to the “Golden Era” of Classic physiques. Schwarzenegger came from an era where classic physiques meant something different than what it does today, and the vacuum pose was the standard. However, it’s clear that the pose is not for everyone. But, Roelly Winklaar has stepped up to the plate and hit a vacuum pose at the Arnold Classic Australia. And it was pretty good! Now, maybe not as good as the real classic physiques in Arnold’s era but Roelly is a lot bigger, so physically there’d be a difference between the bodybuilders back then, and currently. So, maybe Shawn Rhoden will set the standard if he can pull off the vacuum pose… he already did in the Open class division.